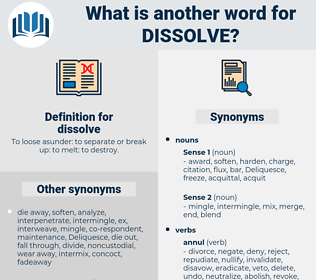 What is another word for dissolve? To loose asunder: to separate or break up: to melt: to destroy. wipe something off/from the map. dismiss, dispel, defuse, remove, rescind, absolve, relieve, diffuse, cancel, cancelled, break, neutralize, lift, disarm, repeal, scrap, revoke, close. dismantle, discontinue, disperse, abolish, terminate, disintegrate, sever, demobilize, eliminate, Eliminating, settle, alleviate, abrogate. repair, open, hold, keep, aid, build, join, approve, help, fix, allow, engage, combine, create, permit, restore, establish, rise, maintain, construct, support, hire, assist, start, employ, sanction, institute, bear, begin, validate. improve, gather, increase, grow, develop, collect. put together, integrate, unmix, assemble, resolve, appear, continue, concentrate, coagulate, unite, marry, solidify. clear, order, mandate, consolidate, decree, enact, ratify, break out, endorse, command, issue, emerge, authorize, arrive, warrant, formalize, hang together, legitimize, band, legislate, prescribe, found, lay down, legitimate, meet, legalize, pass, loom. Almost as soon as he looked at Caroline's little difficulties they seemed to dissolve beneath his eye. There is no obstacle so great that it will not dissolve and vanish away into thin air in the heat of such an overwhelming desire and ambition as this. etch, melt, cut, run, melt down. change integrity, change state, terminate, alter, modify, turn, disintegrate, end, change. break down, disconcert, lose it, upset, snap, discompose, untune, discomfit.